When I See This Coupon In the Mail I do a Happy Dance and you should too! This coupon from Staples means you are about to buy money for less than money costs! Unfortunately, this is a one time use coupon code (I tried to use it twice) so there is no point in giving it out but be on the lookout in your mail for the very same coupon. I have gotten it many times in the past. The coupon is for $25 off a $100 order and it works for Visa Gift Cards orders as well. A $100 gift card costs $106.95 so the final price will be $81.95 or 18.05% off. This is before you do any of the other shtick I will show you. I believe I have been blacklisted from staples.com from buying $100 gift cards because they always tell me they are out of stock when I know they are actually in stock. It seems to block my IP address. 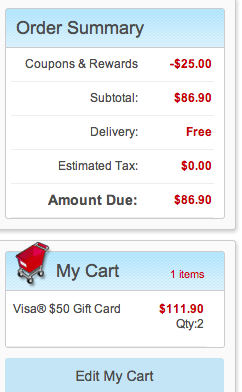 Either way, I am still able to buy two $50 gift cards at a lower value (higher overall fees). Instead of paying $81.95, I had to pay $86.90. Still, not too shabby! Start shopping from Shop Discover online shopping portal and you will receive 5% back as well when you pay with a DISCOVER IT™ Card. You will still get your 1% cashback for everyday spending for a total of another 6% back or another $5.21 into your Discover account. I buy $25 Bed Bath and Beyond gift cards for $20 of Discover rewards so I consider their rewards worth 1.25x their stated value or 7.5% in actual value for this purchase ($6.51). You can cash out your gift cards using Bluebird at Walmart so it is all profit!